Last Updated Apr 2019 – All meats are not created equal. Any chef worth his or her salt will tell you that there’s a huge difference between a prime cut of venison and the cheapest side of beef in the discount aisle. All too often, however, poor cooking technique will turn an expensive, high-quality piece of meat into a tough, flavorless mess. In almost all cases, the culprit is poor temperature control. Some cooking schools still teach old methods of estimating temperature, like using the base of your thumb to gauge the doneness of a steak, for example. These methods aren’t very precise. No two people have the same definition of “golden brown“, either. If you want to control the temperature of your meat (and you do), you’re going to need a good thermometer. Luckily, these are pretty convenient and affordable. An instant-read thermometer is a must-have gadget for any indoor cooking. You can stick it in a piece of chicken or pork and instantly know exactly how done it is. When it comes to outdoor cooking (and broiling and baking), however, you often want something a bit more permanent. 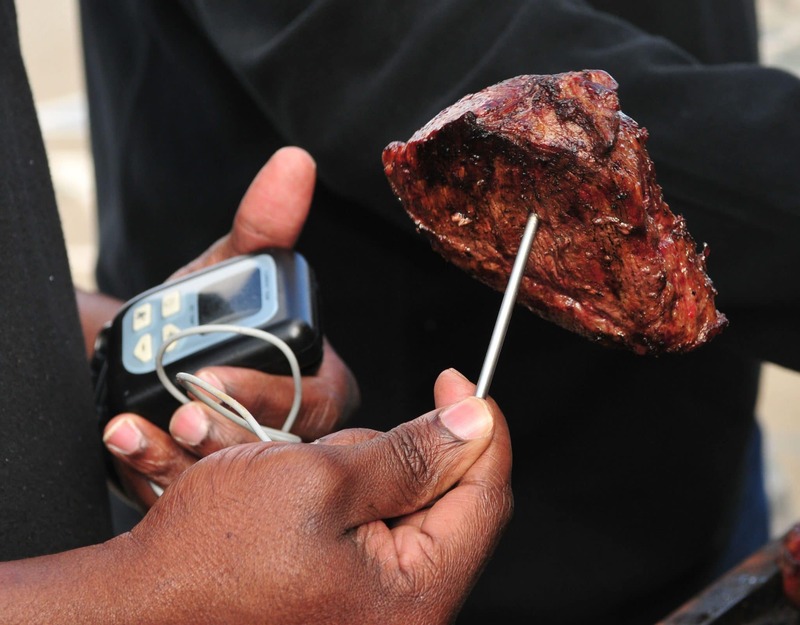 It’s one thing to stick a thermometer into a steak when you think it’s about done. It’s another to check on the ribs that you’re slow cooking every few minutes as they near completion. Not only do you lose a tremendous amount of heat when you open the grill, it’s also a big hassle to walk out to the barbecue constantly in order to check the meat. The same thing applies to a turkey in the oven. While you can make do with an instant-read thermometer, it’s not really the right tool for the job. Wireless meat thermometers were created to solve these issues. They’re pretty simple conceptually: they’ve got a temperature probe (usually two) hooked up to a wireless transmitter that constantly broadcasts the temperature of your meat to a paired receiver. Not only can you remotely check on how your meat is doing from anywhere in the house, the receiver is also programmable and can alert you when the meat hits a certain temperature. Most wireless thermometers also feature timers, enabling you to keep track of all aspects of your cooking job from one place. If you’re already carrying your phone around the house, this thermometer will be an excellent addition to your kitchen arsenal. If you want an easy user interface and you think using your phone for cooking is cool, this is a great choice. 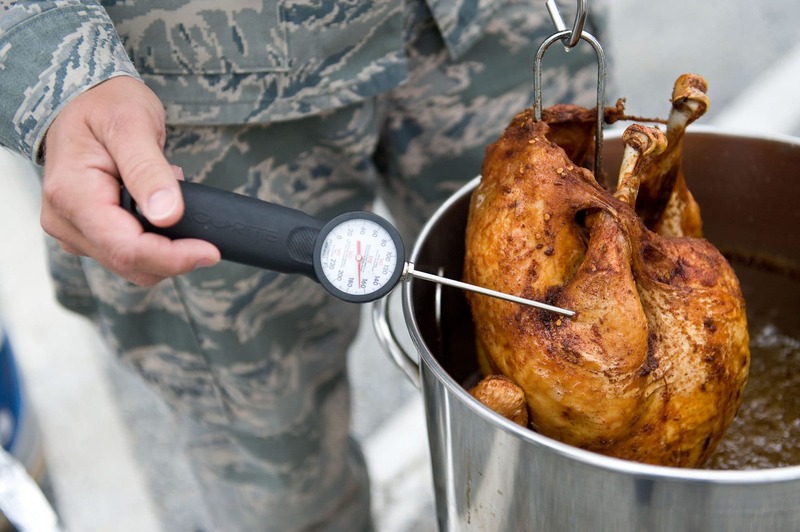 If you’re more into heavy duty cooking, check out this thermometer. It's a must-have for serious backyard chefs. While traditional wireless thermometers have a receiver paired with their base, this Silipower chooses to use Bluetooth technology instead. As long as your phone, tablet, or PC is within 170 feet, you’ll be able to monitor your cooking progress on a companion app. Like the Lumsing below, however, you’ll need to provide your own device in order to use this thermometer remotely. While there’s a small LCD display on the base, you’ll need to be in the kitchen in order to read it and it doesn’t have any alarms or timers. The companion app offers both, luckily, and has a clear and intuitive interface. You’ll have few problems monitoring complicated cooking jobs from the other room. 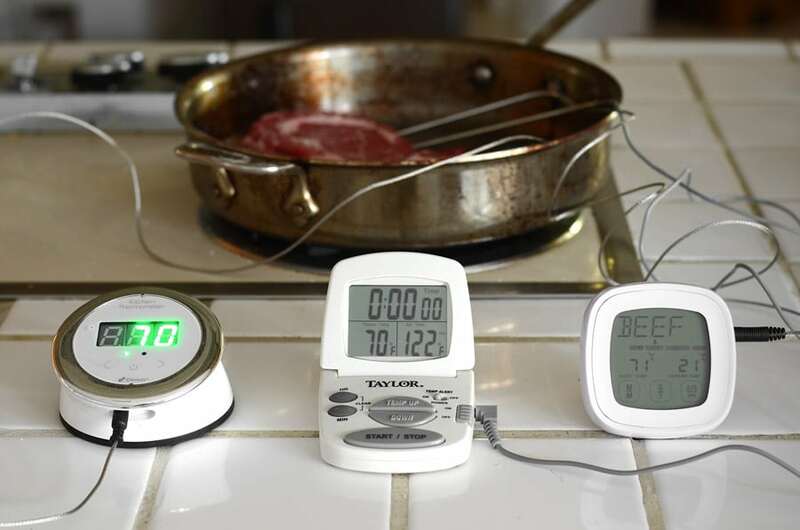 Even better, this thermometer comes with a whopping 6 probes, allowing you to monitor six individual pieces of meat. There aren’t very many big downsides to this unit, but there are two small ones. First, it’s not waterproof, so you can’t leave it outside next to your grill or smoker. 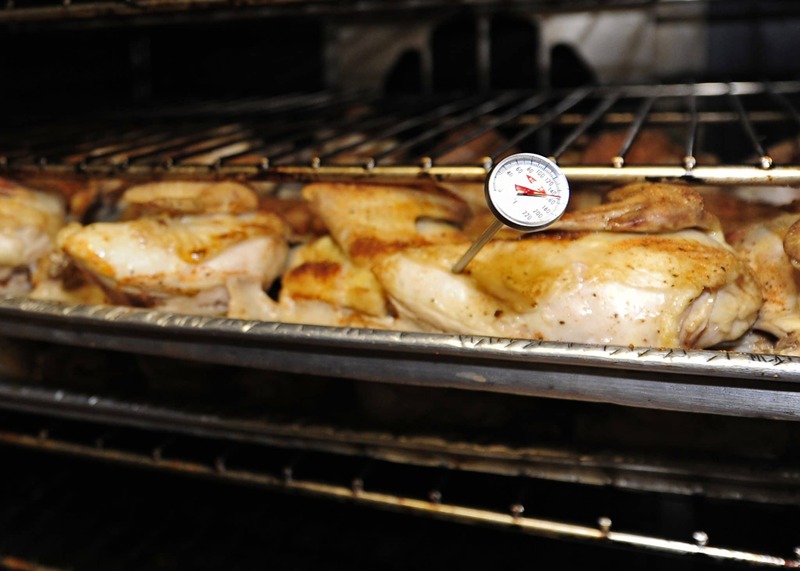 Second, the probes are rated to 570 Fahrenheit, which is well within the range of a powerful broiler or roaring grill. 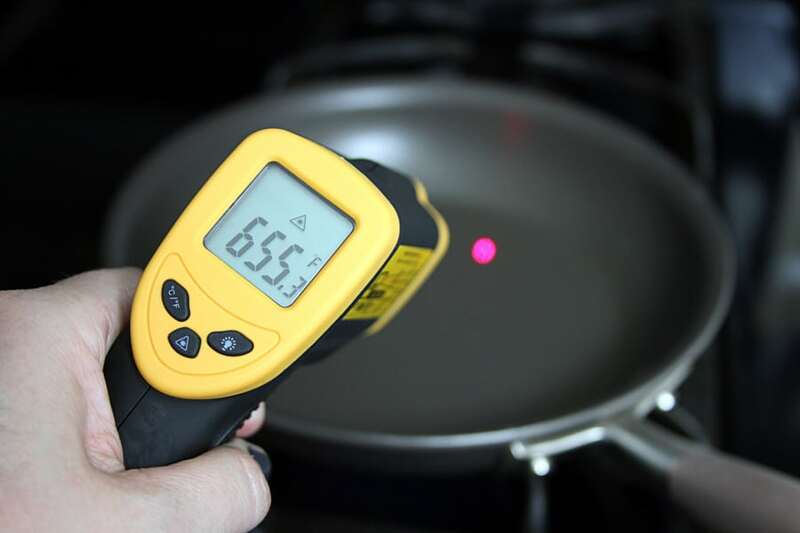 While you won’t hit anywhere near 570 in most cases, you won’t want to accidentally drop a probe into hot coals or leave one in your oven indefinitely. If you’re already carrying your phone around the house, this Silpower will be an excellent addition to your kitchen arsenal. Be sure to check out the Lumsing below as well for another take on the Bluetooth thermometer concept. Like the Silipower above, this thermometer doesn’t come with a receiver at all. If you only use the stuff that comes in the box, it’s got a basic LED readout on the base that you’ll have to use to monitor your cooking. While this is still pretty nice if you’re in the kitchen or next to the grill, you’ll need to pair it with another device in order to monitor things remotely. Luckily, Lumsing has made that easy. This thermometer can connect with a tablet, phone, or laptop via Bluetooth and deliver constant updates over your favorite app. Instead of having to carry some new gadget around the house, all you need to do is keep your phone handy. This also has the interesting side effect of making this thermometer incredibly easy to program. Rather than being limited by a small number of plastic buttons, Lumsing can design its companion app to be incredibly intuitive and easy to use. The specs on this Lumsing are pretty nice. It’s available in both one-probe and two-probe variants (I’d recommend the two-probe version since it’s not too much more expensive and being able to monitor your oven / grill temp is pretty handy). 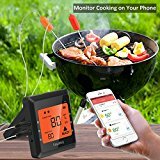 The Bluetooth transmitter works out to about 300 feet, while long cords on the temperature probes enable you to place the base fairly far from your oven or BBQ. Best of all, Lumsing offers a lifetime limited warranty with every unit sold. They’re pretty confident in the durability of this product, so you don’t have to worry about it breaking or burning out. As far as downsides go, the temperature probes only go up to about 482 Fahrenheit. You certainly don’t want your meat to get anywhere near this hot, but this does limit how you can use your oven or grill temp probe. You’ll want to remove any probes from your heating area before you broil or sear anything. Other than that, this Lumsing is pretty great. It even takes fewer batteries than the competition by using your phone instead of its own receiver. If you don’t want to carry around an extra gadget, you want an easy user interface, or you just think using your phone for cooking is cool, this Lumsing is a great choice. If you’re more into heavy duty cooking, however, check out the ThermoPro below. 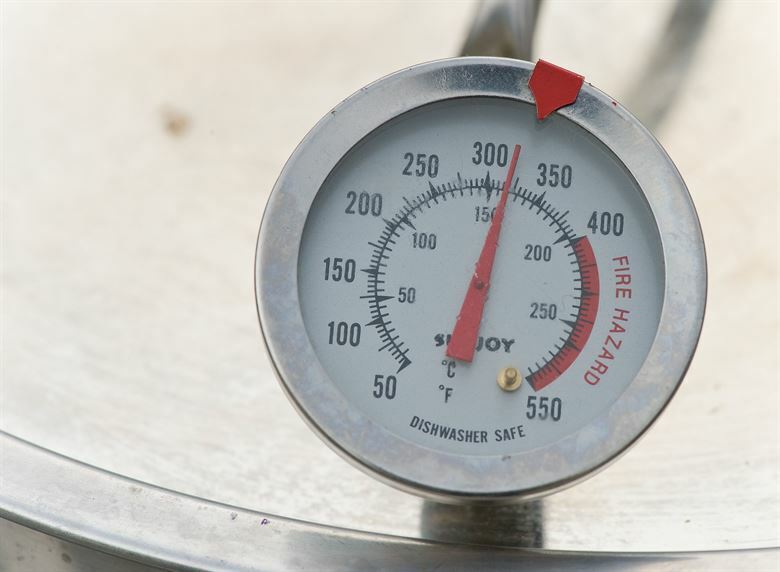 This is a serious thermometer for the serious chefs. Not only are the twin probes rated for temperatures of up to 716 Fahrenheit, ThermoPro also offers a lifetime warranty on the sensors they contain. If you experience any problems at all with your probes, they’ll replace them. No questions asked. This unit contains all of the features you’d expect from a professional kitchen gadget. It’s got a simple back-lit LCD display that clearly conveys all of the important information without any extra bells or whistles. The receiver comes with 9 meat presets pre-programmed and offers alarms, a count-down or count-up timer, and operates up to 300 feet away from the base. It runs off of 4 AAA batteries. As far as meat thermometers go, this unit is pretty ideal. It’s difficult to come up with downsides. While it’s not as fun to use as the Bluetooth Lumsing above, this meat thermometer does a pretty good job of being a meat thermometer. Sure, you’ll have to put the receiver in your pocket as well as your phone, but the heavy-duty probes mean that this unit is a must-have for serious backyard chefs. I’m not usually a big fan of claiming that one product is the “best” in its category, and meat thermometers are no different. The type of cooking you do, how often you cook, and how big your pockets are will determine which device is best for you. If you’re a serious barbecue enthusiast, the ThermoPro will pull slightly ahead of the others. If you want a clearer interface, one less gadget to carry, or a lifetime warranty on the entire thermometer, the Lumsing is the best choice. Finally, the Silipower offers additional probes over the Lumsing, enabling you to have perfect control over complicated cooking jobs. Even if you’re only planning on using two probes, it’s worth consideration if you prefer the aesthetic or you prefer its app over the Lumsing’s. By weighing the pros and cons of each unit against the needs of your household, you’ll be able to make an informed buying decision and get the very best wireless meat thermometer for your kitchen or grill.